One of the Hindu deities, Lord Ganesha is considered as the remover of obstacles. You can place the statues in temples and at new construction site for bringing in prosperity and good luck. 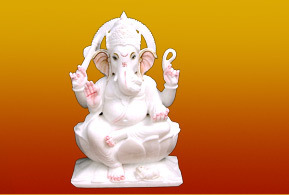 Various types of Marble Ganesha Statues are manufactured using properly finished white marbles. Graceful designs, intricate cuts, smooth edges, seamless finish and fine polish are the few striking attributes of these statues. Depending upon the preferences of clients, these statues are available in multitude of colors, sizes and models. One can ideally place these statues in temples, offices and homes to create a calm and peaceful aura. 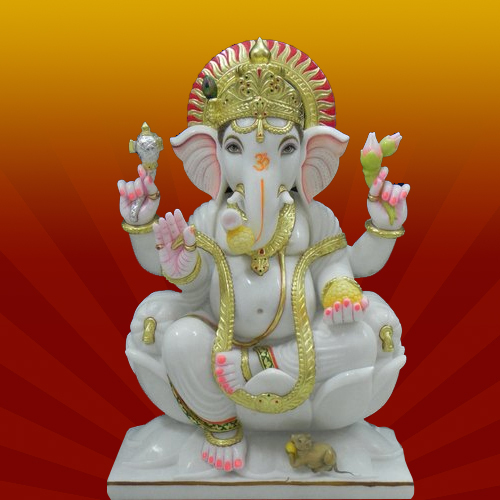 To contribute in your faith towards God, BM Natha Exports offers wide range of beautiful Marble Vinayak Statue. These holy statues are manufactured from high quality shiny surface white marble to give a divine look to the statue. To manufacture these statutes we use quality raw material provided by our reliable vendors. Also, we use many colors such as gold lining and shades of red and orange to make the statue look appealing and pleasant. The posture of God is equally important that is why we emphasis on minute detailing to give you the best of the statue. With several years of experience BM Natha Exports offers various types of beautiful Lord Ganesha Moorti. These statues are manufactured by high quality white marble painted in different colors to beautify the statue. 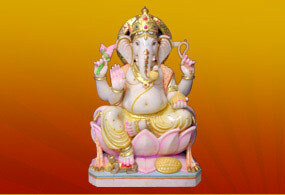 In these statues Lord Ganesha is seated on a pink lotus with his mouse near his feet. To decorate these statues of Lord Ganesha, we use nice colors combination, small multi colored stone to give the statue a divine look. These Moorti are available in market with durable prices. BM Natha Exports have a marked and reputed name in the market in manufacturing various types of Ganesha Statue / Moorti. These statues are so designed that due to their manufacturing beauty these can grab anybodys attention. With well crafted structure these statues are superbly designed with the help of different colors, stones, prints etc. With artistic four arms and a mouse near the feet we give you the best looking statues with every detailing like hairs, sitting posture, hands shapes etc. To decorate these statues of Ganesha, we use nice colors combination, small multi colored stone to give the statue a divine look. These statues are available in market with durable prices. 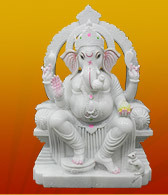 BM Natha Exports have a vast experience in manufacturing different holy statues, one of these is Marble Ganesha. These statues are manufactured from high quality shiny surfaced white marble to give smooth and sleek finish to the statue. Every raw material used to manufacture these statues is provided by our reliable vendors. 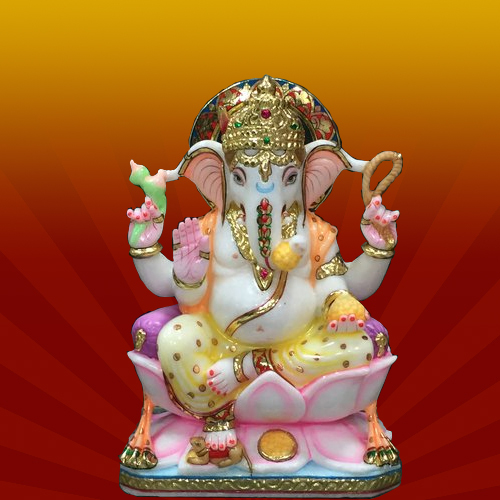 We all know the importance of Lord Ganesha’s blessing for a new beginning with a good note, to make your beginning even better we assure you of pleasant looking statue with a nice appeal. The posture of God is equally important that is why we emphasis on minute detailing to give you the best of the statue. Some of the highlights of these divine statues are: Manufactured by high quality white marble. Available with minute detailing. Attractive and Affordable. 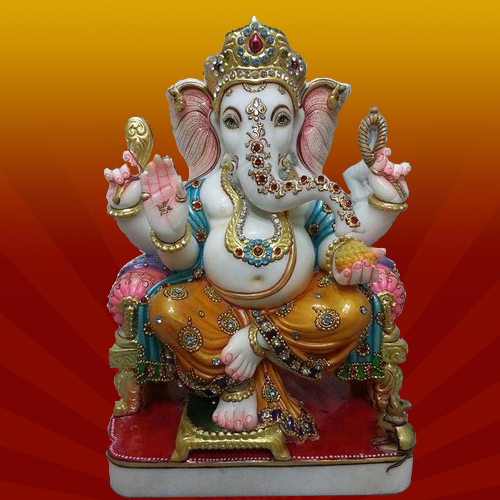 Available in various sizes as per clients specifications">BM Natha Exports have a vast experience in manufacturing different holy statues, one of these is Marble Ganesha Moorti. These statues are manufactured from high quality shiny surfaced white marble to give smooth and sleek finish to the statue. 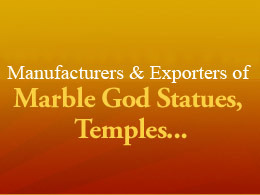 Every raw material used to manufacture these statues is provided by our reliable vendors. 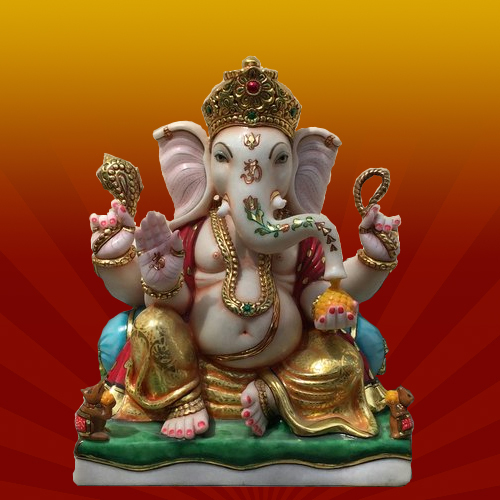 We all know the importance of Lord Ganeshas blessing for a new beginning with a good note, to make your beginning even better we assure you of pleasant looking statue with a nice appeal. The posture of God is equally important that is why we emphasis on minute detailing to give you the best of the statue. Available in various sizes as per clients specifications.